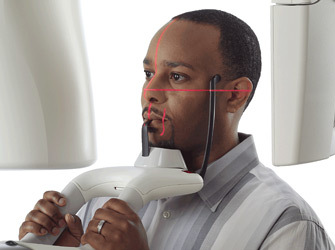 The Midmark Vantage® Digital Panoramic System has been designed to improve the way you work. With a full featured, Windows® computer integrated into the VantageTouch® operator panel, Vantage gives you the flexibility to prepare and deliver diagnostic images chairside, allowing you more time with the patient for consultation and image review. 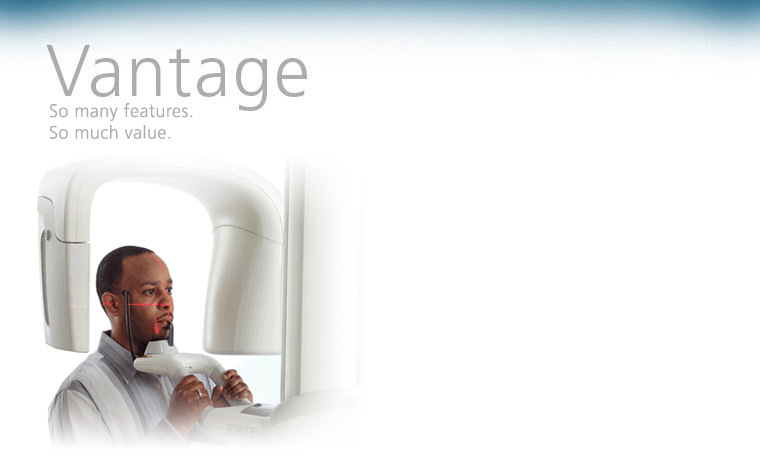 Vantage boasts an exceptional array of features, from ease of exam set up to positioning assistance with VantageTrust℠, to support efficient imaging work flow in your practice and to provide better patient care. The Vantage Panoramic System delivers high-value features standard on every system. The VantageTouch® operator panel, provides simplicity from exam set-up to image capture and review. Select from the five pre-programmed exam settings, patient size, and technique selections with just a touch. A preview of the captured image is immediately displayed presenting the information required to assess the image prior to releasing the patient. VantageTouch® speeds work flow from start to finish. Exclusive Clarity Enhanced Imaging Filter Set provides superior diagnostic imaging options for more accurate diagnosis. The breakthrough design of Clarity Enhanced Imaging Filter Set provides improved visualization for more accurate diagnosis. Clarity employs multi-frequency processing by collecting all image information, then separating each component of the visual spectrum. The components are processed individually, with unwanted diversions minimized before reassembly into the presented diagnostic image. Clarity improves visualization of the midsaggital region, reduces ramus shadow, and mitigates open airway passage over penetration in all Progeny Vantage® Panoramic views. Clarity reduces the amount of unwanted distractions, such as ghosting, often found in overlapping bony tissue while demonstrating a wide range of grey shading. Clarity Plus brings enhanced visualization to patient anatomy by highly defining edges, improving the recognition of slight differences in tissue density. The Clarity Image Filter Set is included with Progeny® Imaging and as a complement to other common image management programs when bringing the Progeny Vantage® Panoramic System into the practice. 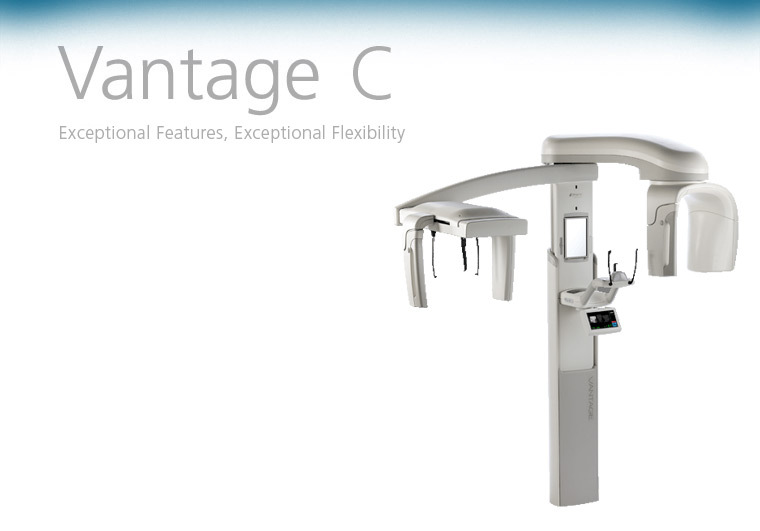 The Progeny Vantage® C is designed to meet your practice needs. Progeny Vantage® C is available with two sensors - panoramic and cephalometric for optimal examination efficiency, or with one sensor when the clinic requires occasional cephalometric exams. 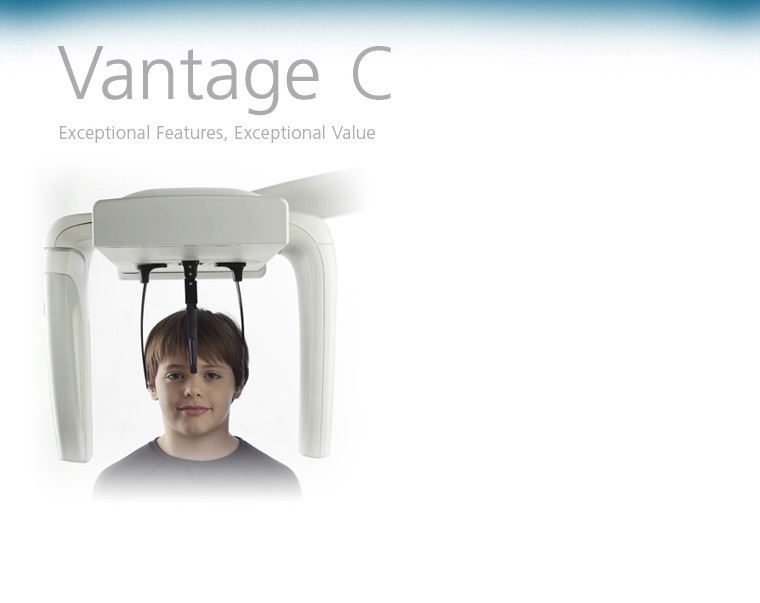 Purchase a Progeny Vantage® Panoramic System knowing that you can add the cephalometric option in the future. 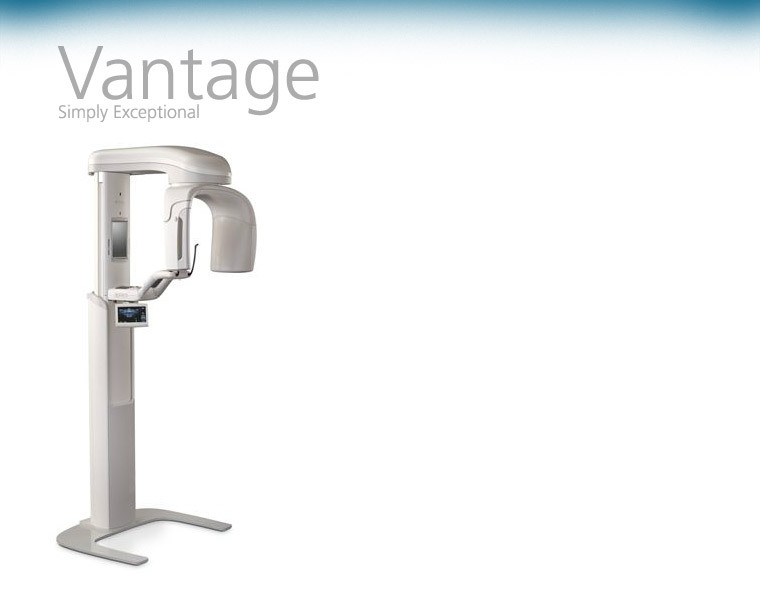 Vantage C provides high value features standard with every system. Integrated with a full-featured Windows® computer, the VantageTouch® operator panel is the center of intuitive, efficent imaging workflow. The cephalostat position automatically transmits the selected view to the VantageTouch® allowing for a streamlined workflow. Tap the screen to select the patient size and technique factors. 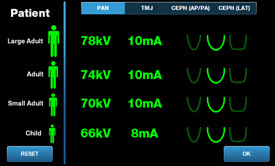 Preview images on VantageTouch® immediately after acquisition for instant evalution prior to releasing the patient. The VantageTouch® is the center for customization options from commonly used patient profiles and segmenation selection to technique adjustments. 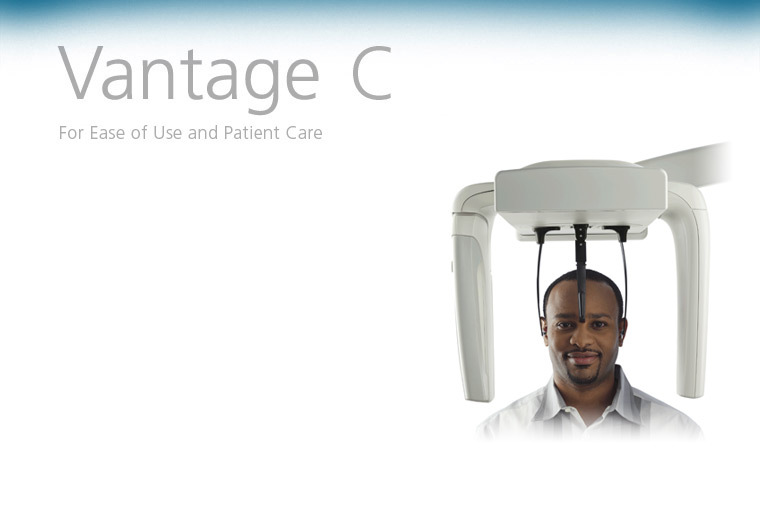 Designed with the latest innovations in technology, the Vantage C helps you focus on caring for your patients. Vantage C gives you the flexibility to prepare and deliver diagnostic images chairside, allowing you more time with the patient for consultation and image review. 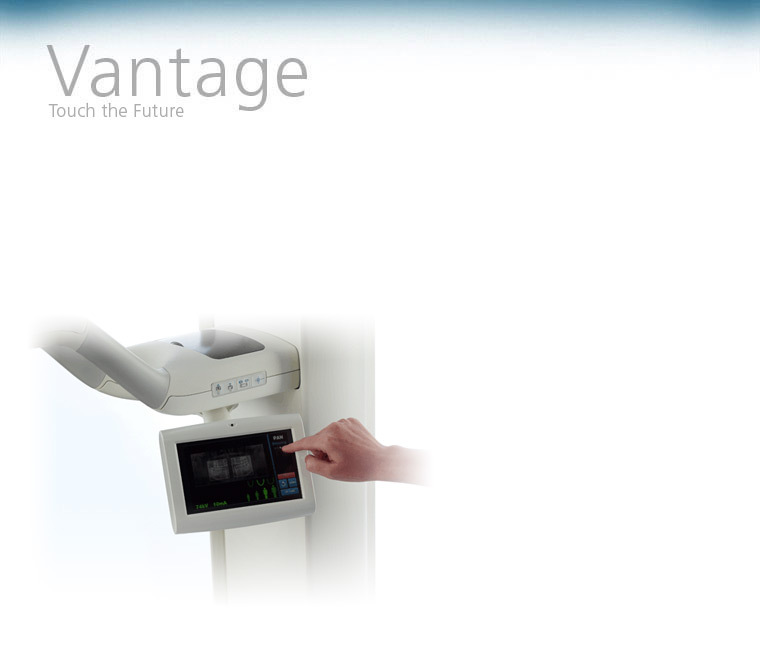 The image is displayed on the VantageTouch® operator panel allowing assessment of the captured image prior to releasing the patient, another feature demonstrating that the Vantage C is designed with priority towards clinical functionality. The cephalostat, naison positioner and ear posts support proper patient positioning and allow patients to return to a repeatable position each time an exam is performed. 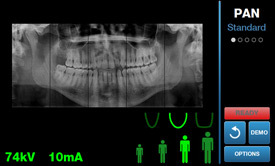 Selectable field sizes limit the areas of exposure to meet the patient exam requirements. With the intuitive graphic icons of the VantageTouch® and the reassurance of VantageTrust℠ positioning assistance, Vantage C will result in staff acceptance and immediate productivity at your clinic. With the exclusive Progeny Clarity Enhanced Imaging Filter Set, Vantage C provides detailed imaging for more accurate diagnosis. Enhanced by the exclusive Clarity Filter Set, Vantage C provides superior soft tissue visualization for the detailed patient profiles necessary to identify the bony and soft tissue landmarks. 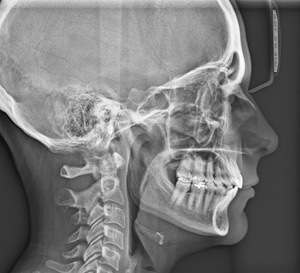 These critical points of reference are essential for accurate measurement in orthodontic patient treatment care planning. 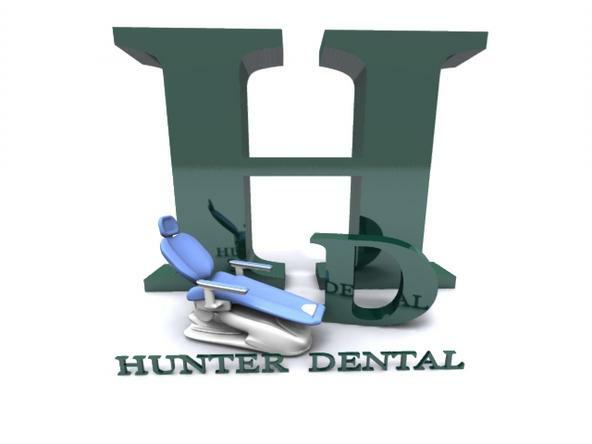 The precision of Vantage C images allow for the evaluation of the condition of the dentition, as well as skeletal and soft tissue regions. 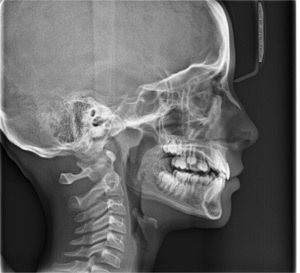 Along with the most widely-used cephalometric views - lateral, AP and PA - expanded positioning choices including Oblique, Waters and Downes, are offered to suit your diagnostic needs for symmetry assessment and observation of hidden or superimposed dentition.